Discover Monarch, the award-winning online homeschooling solution. With this no-risk trial, you'll find everything you need to help your student learn online. We're convinced that once you start homeschooling with Monarch, you'll love it and want to become a subscriber like so many others. The Monarch free 30-day trial requires a promo code for access. If youâ€™ve seen an ad or promotion for this free trial, a promo code would have been listed on it. Please refer to that material to find your promo code. Your Monarch Plan gives you unprecedented access to 50 online homeschooling courses for up to 3 students in the five subjects of Bible, history and geography, language arts, math, and science. Learning never stops! Perfect for your on-the-go schedule, Monarch's Christian online homeschool curriculum is accessible around the clock. Completely online, Monarch makes software installation a thing of the past! 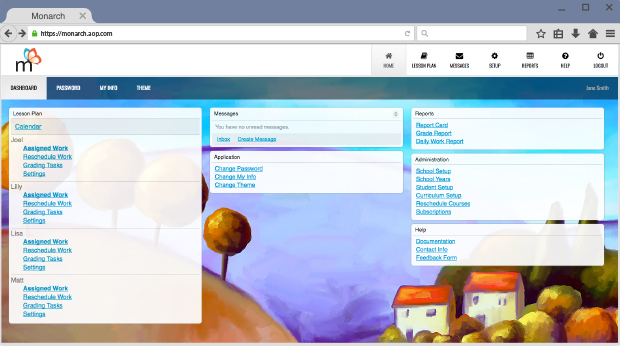 With just a username and password, you're curriculum-ready in seconds. Enjoy freedom from paperwork! 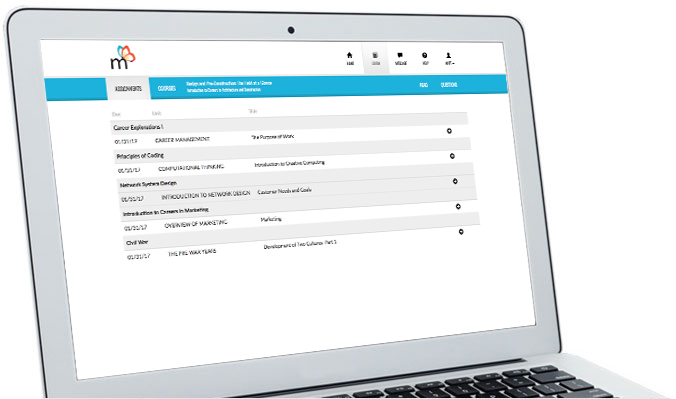 Automatic grading and recordkeeping conveniently record lesson assignments, test scores, and upcoming assignments for more hands-on teaching time. Bring learning to life with over 50,000 multimedia elements! Immerse your child in an enriching, multi-dimensional educational experience that includes video clips, audio files, challenging games, interactive exercises, and more. AOP is honored to have won these prestigious awards for our time-tested Christian homeschool curriculum products. Monarch Bible offers a complete, online study of the Old and New Testaments. Developing a firm biblical worldview, this Christian homeschool curriculum for grades 3-12 outlines how scriptural concepts apply to all academic areas and explains practical Christian living. Using verses from the King James Version, these Bible lessons cover seven major themes, including theology, the attributes of God, biblical literature, biblical background, Christian growth, Christian evidences, and special themes. Select a grade from the list below to download the Monarch Bible Scope and Sequence in PDF format. Monarch History & Geography is an in-depth, online study that increases students' appreciation of God's activity through history as recorded between man and his relationships. This Christian homeschool curriculum for grades 3-12 encompasses six major strands, including geography, history, government, citizenship, economics, and social studies. Special topics like career preparation and finance management also are included. Select a grade from the list below to download the Monarch History & Geography Scope and Sequence in PDF format. Monarch Language Arts is an integrated online program for grades 3-12 that weaves the English skills of reading, writing, listening, and speaking together throughout units. Elementary grades study English skills through an incorporated presentation, while middle and high school grades focus on skill development unit by unit. This Christian homeschool curriculum has six major content strands, including reading, writing, spelling, grammar, composition, and speaking and listening. Select a grade from the list below to download the Monarch Language Arts Scope and Sequence in PDF format. Download a PDF of the English/Language Arts Resources List for a complete overview of reading resources for grades 3-12. Monarch Math is an online Christian homeschool curriculum that trains students in grades 3-12 to successfully use mathematics in real-life situations. Major content strands developed at all grade levels include number skills, geometry, algebra, data analysis, and probability. Monarch Math uses mastery learning techniques to build upon previously taught concepts and promote independent cognitive reasoning. Select a grade from the list below to download the Monarch Math Scope and Sequence in PDF format. Monarch Science is an interactive online program for grades 3-12 that focuses on explaining the physical universe God created, while developing students' observation skills. The elementary and middle school grades present each area of science in an independent survey basis, while high school grades focus on a specific area of science, such as biology, chemistry, and physics. The four major strands flowing throughout this Christian homeschool curriculum are life science, Earth and space science, physical science, and the nature of science. Select a grade from the list below to download the Monarch Science Scope and Sequence in PDF format. Select a grade from the list below to download the Monarch Science Supply List in PDF format. Monarch electives can be added to a subscription plan easily at any time to create depth and offer variety to traditional coursework. Available for students in grades 4-12, these Christian homeschool curriculum electives widen students' knowledge and provide a well-rounded educational experience. Diverse electives allow for concentrated focus in specific discipline areas. Subject areas include world languages, history, literature, math, science, geography, health, civics, career courses, and more. 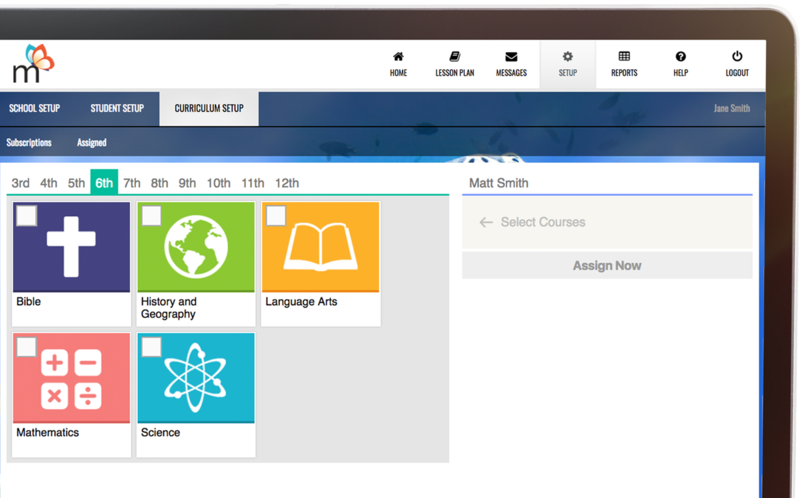 Know what's coming up in Monarch with handy screens that show your child's daily assignments, a curriculum overview, due dates, subject reviews, and grades. Monarch is compatible with most web browsers on both Windows® and Macintosh® operating systems. Unlike traditional textbooks, Monarch provides your child with the most up-to-date content. Course updates are made automatically, so you never have to install updates again. Monarch's secure learning environment stores your child's academic records for seven years after your subscription ends. Accessible anytime, your child's grades are neatly logged, so you have everything to accurately prepare high school transcripts. Monarch's unsurpassed online learning program lets you leave a smaller carbon footprint in the world by eliminating the need for textbooks, CD-ROM software, or printed copies of assignments. Monarch provides a convenient and clear series of views for teachers. 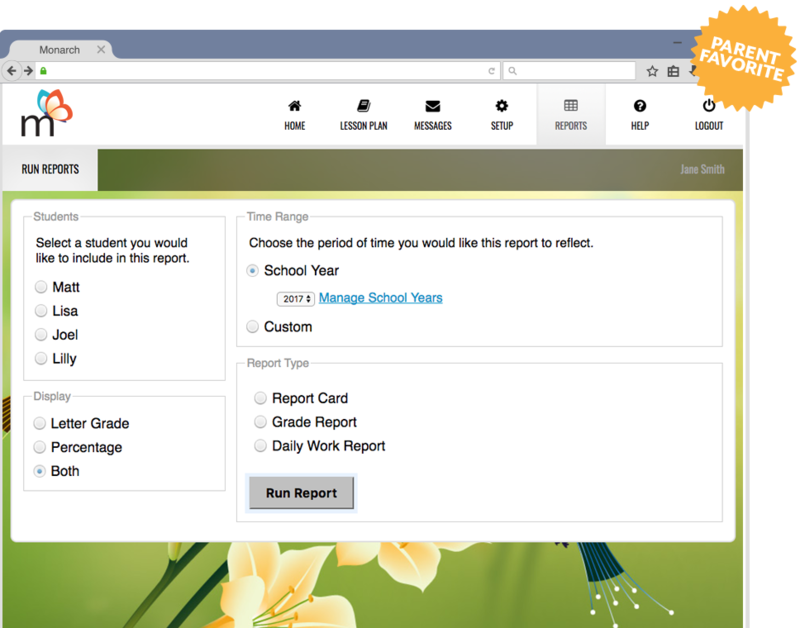 Track assignments, progress, grades and more from a secure screen. Teachers can know exactly where their students stand and focus efforts to address and resolve challenges, reward achievements and celebrate successes. Every homeschool parent knows that correct educational placement testing is a key component to successful homeschooling. At AOP, we want to improve your effectiveness as a teacher and promote your child's academic enjoyment. To accurately place your child into our Christian homeschool curriculum, we offer free placement test resources for Monarch. To access information on setting up Monarch Math and Language Arts placement tests, you must first have an account and be logged into our AOPs website. This complimentary webinar presents an overview of Monarch to those who have newly joined the curriculum and those who are still in search of the right fit for their homeschooling family. Get a detailed summary of Monarch's features and a demonstration of how the online curriculum works from both teacher and student views, as well as an opportunity to ask questions that are unique to your student's learning needs! Every homeschool parent knows that correct educational placement testing is a key component to successful homeschooling. At Alpha Omega Publications, we want to improve your effectiveness as a teacher and promote your child's academic enjoyment. To accurately place your child into our Christian homeschool curriculum, we offer free placement test resources for Monarch. To access information on setting up Monarch Math and Language Arts placement tests, you must first have an account and be logged into our Alpha Omega Publications website. Before making the investment in Monarch, get a solid overview of the curriculum with this free training webinar! 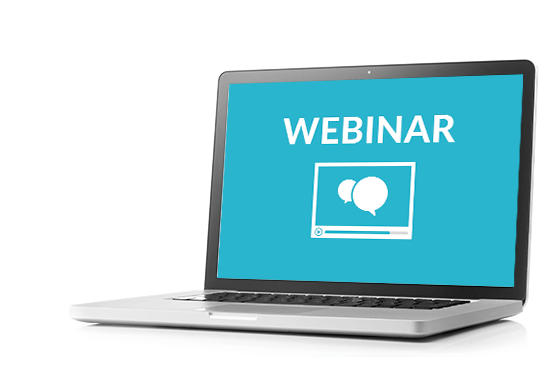 Hosted live by a training specialist from AOP, this 30-minute overview presents a detailed summary of Monarch's benefits and resources. Conducted in a comfortable telephone environment as you follow along online, this webinar is sure to give you the confidence you need to choose the right homeschool curriculum for your family. Pay as you go for a budget-friendly approach to homeschooling or save even more when you purchase a yearly plan. Both options are available for an individual student or the whole family. Explore and discover Monarch, the award winning online homeschooling solution. With this no risk trial, you'll find everything you need to help your student learn online. We're convinced that once you start learning with Monarch, you'll love it and want to become a subscriber like so many others.